The innumerable recorded and researched cases of past life experiences clearly point to life after death. In all the recorded cases of reincarnations, it was found that there was a variable time lag between the death of the person and his next reincarnation on Earth. So, where do we go after death till our reincarnation on Earth? Is it a single plane of existence or are there a variety of planes of existence? If so, what are the factors that decide where we go after death? In this article, we present the answers to these and other questions about this topic. These answers are obtained through The Torah, new testament and the Quran in a great detail. NEW AGE movements have different philosophical ideas . When a person dies the physical body ceases to exist. However, the rest of his existence or consciousness continues. 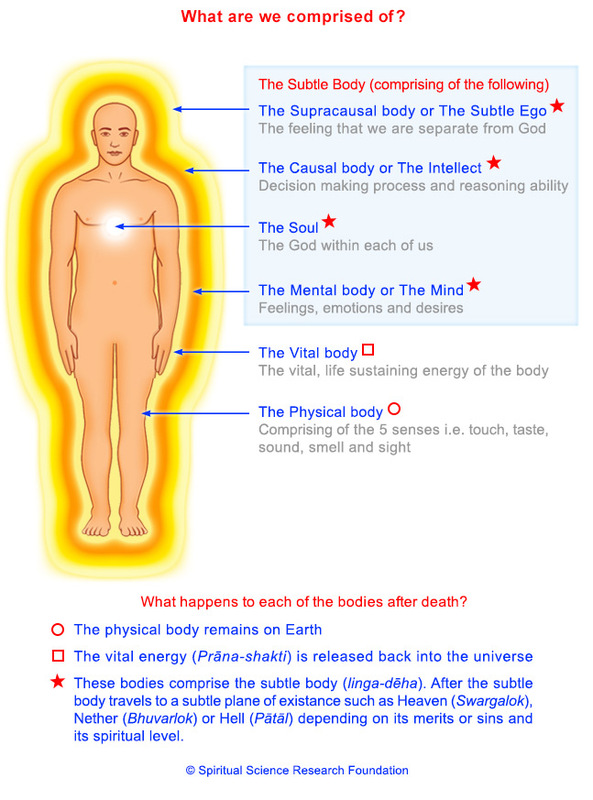 The existence of the person minus the physical body is known as the subtle body (linga-dēha) and it comprises of the mental, causal (intellect) and supracausal (subtle ego) bodies. This subtle body then goes to one of the 13 subtle planes of existence other than the Earth plane. There are 14 main planes of existence in the Universe. Seven of them are positive planes of existence and seven are negative planes of existence. 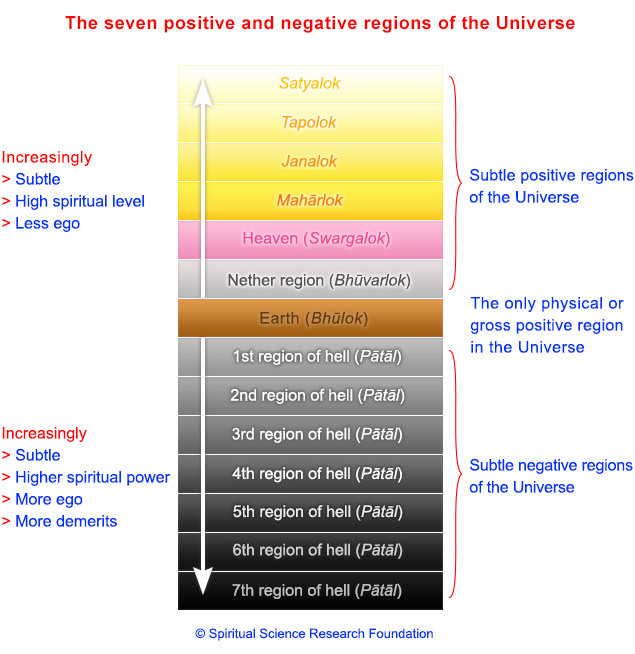 The seven negative planes of existence are commonly known as Hell (Pātāl), jahanam, hell fire, . There are numerous sub-planes within these main planes of existence. Seven positive planes of existence: The planes of existence occupied mostly by living persons and subtle bodies doing righteous deeds and engaged in spiritual practice according to the positive path of spiritual practice are known as the seven positive planes of existence or saptalok. By positive path, we mean the orientation of spiritual practice is towards God-realisation, which is the ultimate in spiritual growth. The Earth plane is the only physical plane of existence in the Universe and is also the first plane of existence in the hierarchy of the positive planes of existence in the Universe. Seven Negative planes of existence: These are planes of existence occupied mostly by subtle bodies that have done unrighteous deeds and are engaged in spiritual practice according to the negative path. By negative path, we mean the orientation of spiritual practice is towards attaining spiritual power, e.g. supernatural powers. This spiritual power is primarily used to enhance one’s control over others or for negative purposes. Thus all subtle bodies that go to any one of the planes of existence of Hell, by virtue of their evil intentions become ghosts. Sub planes of existence of Hell (Narak): Every plane of existence of Hell has a sub-plane known as Narak. For example, the first plane of existence of Hell will have within it a sub-plane that is known as the first Narak. Narak is reserved for the worst ghosts (demons, devils, negative energies, etc.) in Hell. The ghosts (demons, devils, negative energies, etc.) occupying the first Narak face more severe punishment and for a longer duration than those occupying the first plane of existence of Hell. 1. For the sake of simplicity, though we have shown the planes of existence one on top of the other in this diagram, in reality they are around us in all directions. It’s just that Earth being the physically tangible plane is seen; whereas the other planes are progressively more and more subtle and hence invisible to the gross eye. In fact different people, though living on the Earth plane experience thoughts and emotions corresponding to the different planes of existence as per their spiritual level or thoughts. For example Saints, i.e. spiritually evolved people beyond the 70% spiritual level, lead an existence corresponding to the positive planes of existence of Heaven and beyond. In contrast a person planning theft experiences thoughts corresponding to the 1st plane of Hell, one planning some act aimed at harming others at 2nd plane of Hell and so on and a person planning murder experiences thoughts corresponding to the 7th plane of Hell. However no 2 planes of existence can be experienced simultaneously, i.e. a person cannot experience thoughts corresponding to 2 different planes, e.g. Heaven and Mahārlok. 2. The Nether region (Bhuvarlok) to be precise is a region that is aligned away from God. We have however depicted it as a positive plane as subtle bodies from this region still have a chance to be born on Earth to progress spiritually. The regions of Hell are represented by darker shades to black, as there is an increase in the subtle basicTama component. Each positive and negative plane of existence beyond the Earth (physical) plane of existence becomes more and more subtle. By subtle, we mean, that which is beyond the comprehension of the five senses, mind and intellect. Satyalok is the subtlest positive plane, and therefore is the most difficult to perceive or comprehend unless the highest sixth sense (ESP) level is attained. Due to lack of spiritual practice and a higher proportion of demerits (sins), most people in the current era go to either the Nether world or one of the planes of existence of Hell. We generally go to the Nether world after death when the proportion of demerits (incurred due to wrong doings on Earth) is approximately 30%. Demerits typically include malice towards others and a lot of desires. The likelihood of being attacked in the Nether world by higher-level ghosts from the lower plane of existence of Hell is almost certain. Earth is the only plane of existence where there is an amalgamation of people with varying spiritual levels. 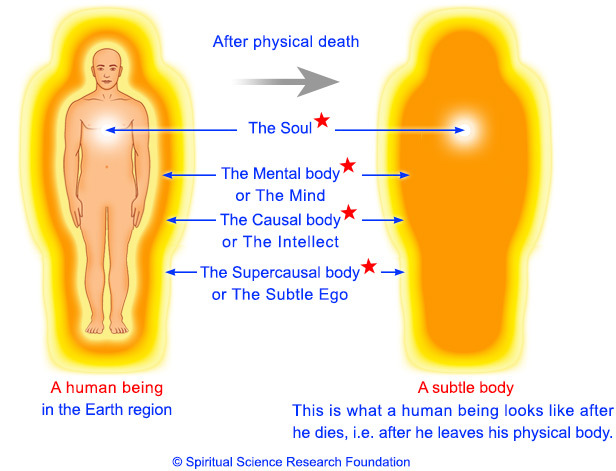 However, after death we go to the precise plane of existence corresponding to our spiritual level. It is important to note that subtle bodies at the borderline of just 40% and thereabouts often get pulled back by negative energies and hence remain in the Nether world (Bhuvarlok). To attain a higher plane of existence that is beyond Heaven, one needs to be at a spiritual level higher than 60%. This can only be achieved by consistent spiritual practice according to the six basic laws of spiritual practice along with a major reduction in ego. By predominant body, we mean the body that is most active, i.e., mental, intellect or the subtle ego. For example, in the Nether plane of existence (Bhuvarlok), the subtle bodies still have a lot of desires and attachments. As a result, quite often they become ghosts trying to fulfill some desire of theirs through their descendants or people on Earth. This leaves them open to higher-level negative energies from the lower regions of Hell; who take advantage of their cravings so as to affect people on Earth. In the Nether world plane of existence, subtle bodies experience only unhappiness as desires cannot be fulfilled. In the plane of existence known as Heaven, subtle bodies experience an overabundance of happiness. This happiness is much beyond the happiness experienced on Earth in quantity, quality and duration. As we go up the positive planes of existence, there is an increase in the quality of happiness and no unhappiness. From the subtle planes of existence below Maharlok, people need to be reincarnated on the Earth plane of existence in order to settle their destiny and complete their give-and-take accounts. If after one’s death one attains higher regions such as Maharlok or Janalok due to higher spiritual level, one does not need to be reincarnated as all of the individual’s remaining destiny (accumulated account) can be worked out from these planes themselves. However, these evolved subtle bodies may choose to be born of their own will. They do so because of their expansive nature primarily to act as spiritual guides for humanity and to help society grow spiritually. In some circumstances people who pass away even below the spiritual level of 60% can attain Maharlok. Here the person’s potential for further spiritual growth is considered. Through spiritual research we have found that that there are 5 factors that influence this potential for further spiritual growth. Other than Earth, spiritual growth is mostly likely to occur only in the regions beyond Heaven such as Maharlok etc. This is because in Heaven, the subtle bodies run the risk of getting caught up in the unending pleasures it offers. In the Nether and Hell planes of existence, the punishment is so severe and also the distress from the other higher-level ghosts is such that it becomes very difficult to rise above the suffering to undertake any spiritual practice of value. What is Hell, who goes to Hell and what is Hell like? No one know for sure but God .This what new age think. As one goes to lower planes of existence of Hell, as the subtle basic Sattva component progressively reduces the environment becomes less conducive to the experience of happiness. Within the planes of existence of Hell, there are some ghosts who do certain types of spiritual practice to gain spiritual power. The highest in the hierarchy of ghosts are sorcerers from the seventh plane of existence of Hell. They have immense spiritual power almost equivalent to a Saint at the 90% spiritual level. They control all the other types of ghosts with lesser spiritual power. As one goes deeper into the various planes of existence of Hell, i.e. from 1st to 7th, the extent of happiness experienced by the subtle bodies therein goes on decreasing and the extent of unhappiness goes on multiplying. The minimal experience of happiness is also due to being engrossed in memories of past positive events, pleasant memories of wealth in a past life, etc. The experience of unhappiness is due to memories of physical pain and insulting events, memories of unfulfilled desires, e.g. regarding education, house, career, expectation of happiness from children in past life. The extent of punishment/pain to be endured in the various planes of existence of Hell and their associated Narak goes on increasing with the subsequent plane of existence of Hell. Also, the period of punishment to be endured in each Narak is in excess compared to the corresponding plane of existence of Hell. If we consider the punishment in first plane of existence of Hell as 100%, then the punishment in the corresponding first Narak region is 50% more, i.e. 150%. One is assigned that plane of existence which matches one’s basic nature in terms of Sattva, Raja and Tama. This is also a function of one’s spiritual level. Hence, subtle bodies from lower positive planes of existence cannot go to higher positive planes of existence and those from first or second negative planes of existence cannot go to the deeper planes of existence Hell. This is similar to how people living in the planes find breathing difficult at higher altitudes, but people staying at higher altitudes manage fine. What decides where we go after death? At the time of death, as the physical body becomes inactive the vital energy used for the functioning of the physical body is liberated into the Universe. This vital energy at the time of death propels the subtle body away from the Earth region. Just as the weight of a projectile decides how far a rocket will propel it, similarly the weight of the subtle body decides which plane of existence it goes to in the subtle planes of existence in life after death. A permanent reduction in the proportion of the subtle basic Tama component and the related characteristics mentioned above come about only with sustained spiritual practice according to the six basic laws of spiritual practice. Psychological improvements with self-help books or trying to be nice are at best superficial and temporary. If a person is actually doing his spiritual practice such as chanting the Name of God at the time of death then the influence of desires, attachments, ghosts, etc. are minimal possible for that person compared to his state when not chanting. This makes his subtle body lighter. Hence, if he passes away while chanting, he attains better plane of existence among the sub-planes than what he would have attained were he to pass away without chanting. At the time of death, if a person is chanting the Name of God and is also in a state of surrender to God’s will, then he attains an even better plane of existence in his life after death and his sojourn is undertaken with lightening speed. This is because the person being in a state of surrender on Earth plane of existence itself, has very less chance of increasing his ego in his life after death. Also, the entire responsibility of his well-being in his life after death is undertaken by his evolved spiritual guide (Guru). The following are the types of deeds in our life on Earth that typically land us in one of the planes of existence of Hell. The extent, duration and intention behind the wrong-doings are important factors deciding the planes of existence of Hell attained after death rather than just the action itself. Suicide and the after life. According to the bible , Quran if you Kill your self deliberately you go to hell. There are two types of death with regards to its timing. Life on the Earth plane of existence is precious and is given to us primarily for spiritual growth. When we kill others, we create/settle a karmic give-and-take account with them. However by committing suicide, we squander away the opportunity for spiritual growth and hence incur demerits or sin. The gravity of sin can vary depending on the circumstances under which a person commits suicide. Invariably the subtle-body of an average suicide case will go to Bhuvarlok. However for greater sins incurred during their life and the circumstances under which they commit suicide they can go to the lower regions of Hell. Killing oneself incurs 30% sin as opposed to killing another person of average spiritual level. Generally people who commit suicide are at a lower spiritual level. Their spiritual level gets eroded due to continuous depression. For example if a soldier were to kill Hitler in a suicide mission to save millions of lives and rid the world of a menace, then merits would be accrued. Alternatively if a suicide bomber killed innocent adults and children then only demerits would be incurred. The above facts about the various planes of existence give us a fair idea of the possible consequences in our life after death of how we live our lives. Only with spiritual practice or with extreme meritorious deeds can one go to the higher planes of existence and thereby avoid unhappiness and punishment and enjoy higher levels of happiness. There are also better chances of a reincarnation on Earth plane of existence in circumstances conducive to spiritual practice. This is so that one moves further up in the subtle planes of existence in the Universe. As we go further into the current Era of Strife (Kaliyug), there is lesser likelihood of people going to the higher planes of existence. Once we go to the lower planes of existence such as the Nether plane of existence or other planes of existence of Hell, we stay there and experience severe unhappiness for centuries until we completely pay for our demerits (sins) by suffering the intense punishments meted there and get a chance to be reincarnated on Earth. To do consistent spiritual practice on the Earth plane of existence according to the 6 basic laws of spiritual practice is like swimming against the tide in the current era. However, it is also a guaranteed way of advancing to higher planes of existence in our life after death. For more details you can study the bible and the Quran regarding this topic. Steve Ramsey, PhD Calgary, Alberta- Canada.